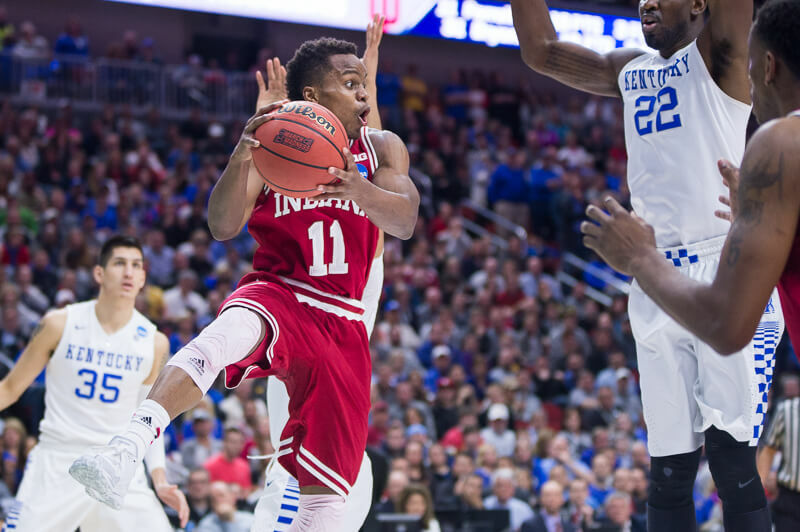 Indiana senior guard Yogi Ferrell was named a John R. Wooden All-American on Monday night, the Los Angeles Athletic Club announced on a 30-minute show on ESPNU. Joining Ferrell on the 10-player team are Grayson Allen (Duke), Kris Dunn (Providence), Perry Ellis (Kansas), Malcolm Brogdon (Virginia), Buddy Hield (Oklahoma), Brice Johnson (North Carolina), Georges Niang (Iowa State), Tyler Ulis (Kentucky), and Denzel Valentine (Michigan State). Brogdon, Hield, Johnson, Ulis and Valentine are the five finalists for the 2016 John R. Wooden Award and have been invited to Los Angeles for the presentation of the award. The winner will be announced on Friday, April 8 at 8 p.m. on ESPN2. In addition to the Wooden All-American accolade, Ferrell was also named a third team All-American on Monday by the National Association of Basketball Coaches (NABC). Ferrell averaged a team-high 17.3 points and 5.6 assists in his final season at Indiana and led the Hoosiers to an outright Big Ten regular season championship, his second in four seasons. Congratulations Yogi. Well deserved recognition for your accomplishments this year. Just more evidence what Yogi has meant and how hard its going to be replacing him. Like Calbert there was only one, so its just going to be different. Josh seems up to the task based on what his teammates are saying, a soundbite here, a snippet there. If James is fully operational he could be huge assuming he buys in defensively. I can’t help but think another “big” will appear on the scene from some path yet to be revealed, will be a little like Christmas when that happens. As much as Yogi deserves these accolades, I really think he deserves more. Look at all the records he’s set at IU. That, plus his numbers, plus leading his injured and beaten-up team to the sweet 16, I really think he should be one of the 5 finalists for the Wooden award. Agreed. Should be Yogi and not Ulis for sure. I’m betting (of course that means nothing, because no one knows for sure), he’d have been in there, had we beaten UNC. Anybody think there is a possibility of Emmitt Holt returning after his year of exile in Iowa? Someone else was floating that idea as well, I like it, he’d be perfect. Another one someone came up with is Goodluck from UNLV which I don’t have an opinion on because I know so little. Very mixed feelings about Emmitt Holt returning. We all make mistakes, but wonder if we should just move on. I think he deserves less. Given his talent, statistically, this year should have been last year. He didn’t have great numbers this season, and didn’t beat out Valentine for POY despite the latter’s missing 5 games. In fact, Valentine had better numbers, overall (19, 8 and 7) and got 30 in a blowout, nationally televised game vs IU. And in the NCAA’S, Yogi started off great with the 20 and 10, but 25 and 4 in the drubbing by UNC and at the hands of his old HS ‘rival’ Marcus Paige, was disappointing. The talent is there, but the mentality to dominate and win-at-all-costs is not. Thought he was the next Isiah, but Zeke was doing things as a sophomore that the senior Ferrell could only dream of. And this, without a 3pt line and under a much more restrictive system with Knight. Yogi is one of Indiana’s better players, but not an all-time great, and certainly not a POY in any universe. These FACTS overwhelmingly prove that you are wrong. * Indiana’s all-time leader in assists with 633 career assists. * Indiana’s all-time leader in games played (137). * Indiana’s all-time leader for consecutive games with a made three-point basket (68). * Indiana’s all-time leader for three-point baskets (158) in Big Ten games. * 195 assists in his senior year place him in first place in Indiana’s all-time Senior Class records. * second place all-time in career three-pointers at Indiana (272). * second place all-time in single-season assists at Indiana (195), two shy of tying all-time single-season leader, Isiah Thomas. * 2nd all-time in single-season assist average at Indiana at 5.57. * 2nd all-time at Indiana in career assists (314) in conference play. * sixth place in all-time scoring at Indiana with 1,986 career points. * ninth place, one point shy of eight place, in all-time scoring for Indiana in conference play with 1069 career points. * led IU in both points and assists for three consecutive seasons. * Hit at least one three-pointer in 99 of his last 100 games. * the first Indiana player in 23 years to win two Big Ten Conference Championships in a four-year span. He is the first Indiana player in 33 years to win two outright Big Ten Conference Championships in a four-year span. * one of three all-time Hoosiers with 1700 career points, 400 career assists and 400 career rebounds. * Yogi joins Calbert Cheaney, Don Schlundt, Damon Bailey, and Kent Benson to rank among the top 10 scorers all-time at IU and win multiple Big Ten titles. * Big Ten’s career leader for scoring for this year’s senior class. * the only player in Big Ten History with 1,900 points, 600 assists and 400 rebounds and 250 3-pointers made. * named a unanimous first-team All-Big Ten choice and becomes the first Hoosier to earn that distinction in consecutive years since Calbert Cheaney did in 1991, 92 and 93. He also is a member of the Big Ten’s All-Defensive Team. * Yogi is one of five Big Ten players to have 125 assists in four straight seasons. Yogi, (2013-16), Aaron Craft, Ohio State (2011-14), Dee Brown, Illinois (2003-06), Dean Oliver, Iowa (1998-2001), Mateen Cleaves, Michigan St. (1997-2000). * finished in ninth place in Big Ten history for career assists (633). * finished third in points scored by Big Ten players during the 2015-16 season. You certainly did your research — I like that! Many of the stats I knew; some I didn’t. I’ll have to agree with you, then: Yogi IS one of IU’s all-time greats (and one of the BIG’s better players, ever). But it’s a short list at IU (thanks to talent level of players there from Knight, to the present). Again, I repeat: for whatever reason, it’s a short list. Unfair to do, but in comparison to those from other conferences, his stats are weak (ACC comes to mind quickly). AND, Yogi still falls short of Isiah (my all-time fave ever, at any level) — especially when counting Yogi’s four years to Zeke’s two (falling two short of the single-season asst record is particularly damning). For me, too many games this year when Yogi wasn’t super. Perhaps it’s Crean’s system, or the player, but I thought Yogi should have been better. Hell, Ulis had 245 assts (UK record) this season as a soph, with a 7 asst avg; Yogi couldn’t even break 200. As 1st Team Defensive, you think he could have switched with Zeisloft after Paige’s 3d consecutive 3 and hounded him the way he did Stauskas 2 years ago in Bloomington (into a 6 pt effort for the night)? Or something. I’ll say this: I like him, but don’t love him, because I expected more. IU great? Yes, if the stats support it (and they do). But no way he’s a Nat’l contender for anything beyond Most Disappointing. Wooden got it right, and so will Naismith. Ulis will get the Cousy, and because he insists on labeling himself 6′, Yogi won’t even get the Pomeroy Naismith award, either. So he does come up short in the end, nationally — ironically enough. Oh, and even Steve “Leadfoot” Alford could get the nod before Yogi. As an all-time IU great, is Yogi third team on that list, too? No, no, no…. I didn’t do the research, somebody on the paid forum did all the work, and kept it updated throughout the year. There are some fantastically talented and knowledgeable people on the forum that make it very much worthwhile to join.